The legal requirements for wastewater discharge change, and so do the needs of customers in industry and commerce in relation to the water qualities used in production. For example, companies are increasingly looking for ways to recycle or reuse water. As a result, there is growing demand for technologies that are energy-efficient and conserve resources. What is more, global challenges, such as limited water reserves and climate change, demand new technologies for the future. Our research and development department possesses a high level of problem-solving skills, which is the result of the interdisciplinary composition of the team. Biologists, chemists, process engineers and environmental engineers with many years of experience in water technologies work together in research projects with leading universities and research institutes. Besides the constant further development of our processes and products, we participate regularly in German and European joint research projects. In internal research projects, we specifically examine key areas, which we regularly redefine on the basis of current developments, as well as issues arising from the needs of our customers. BRAMAR is a German-Brazilian joint research project whose objective is to improve water management in semi-arid regions of Brazil. In this context, Envirochemie focuses on water recycling in industrial production. Different process concepts with chemical-physical, biological and membrane-specific processes are examined in laboratory experiments in Germany and in pilot plants in Brazil. In the ESiTI joint research project, the options for flexibilising the energy flows in a sewage treatment plant are examined from technical, ecological, economic and social points of view. Envirochemie is the project coordinator in the ElektroPapier joint research project, which pursues the approach of producing electrical energy from microbial activity in the decomposition of the constituents in wastewater. The objective of the project is the operation of a pilot plant with real wastewater flows (municipal and industrial). To achieve this, innovative paper-based electrodes will be developed, microbial electricity production examined and a pilot plant with optimised flow conditions designed and built, among other things. In the AKIZ joint research project, sustainable water technology concepts were devised to overcome wastewater problems associated with industrial dischargers in Vietnam. The main focus here was on the adaptation of new water technology to local requirements using simplified operating concepts and robust components. In this context, Envirochemie developed a pilot plant for resource recovery using membrane technology, and implemented this on a pilot scale. The pilot plant was successfully operated on site in Vietnam. The overall aim of NanoPurification was to develop innovative nanoscale substances and materials and see them transferred to the conventional water treatment and wastewater disposal sector. In this context, a water treatment system was developed combining nanoscale composite microfilters with UV decontamination in order to create a highly efficient and multifunctional solution. Envirochemie implemented a pilot application in the industrial water sector in which new ground was broken in the manufacture of microfilters as well as in the use of UV LEDs. As part of the "AquaFit4use" joint research project, research was undertaken into the recycling of wastewater flows and process water part-flows in various water-intensive industrial production contexts such as the paper industry, but also the food and textile industries. Cross-industry process chains for recycling water were devised and new solutions in water technology were developed. The key priority was the reliability of the processes involved, taking account of the cost situations in the sectors concerned. The tasks included intensive laboratory studies into selected recycling technologies, as well as verification of the processes involved and optimisation on a pilot scale. The purpose of the KOMPLETT joint research project was decentralised high-tech water recycling. The objective of the undertaking was to purify grey and foul water from houses, offices and hotel complexes to the maximum possible extent (even taking the grey water right up to drinking water quality). 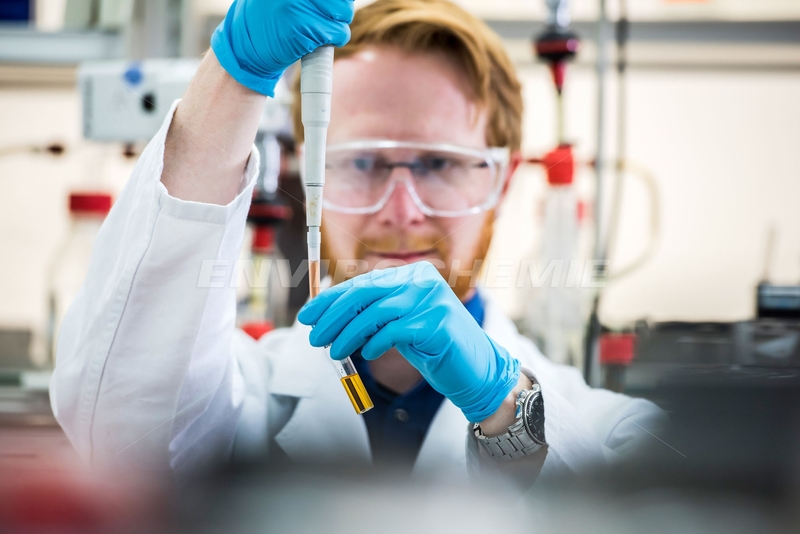 The plant technology developed by Envirochemie was subjected to comprehensive tests. Once purified, the water was reused in the buildings for the purpose of washing clothes, flushing toilets or showering.